Issue #34 is not just our official BATBOOK OF THE WEEK — it’s currently the top title in all of Gotham! I was not an early adopter when it came to Peter Tomasi’s Batman and Robin. The guy had the misfortune to follow what Grant Morrison had done on the book, then was caught under the long shadow of Scott Snyder’s Court of Owls saga at the launch of the New 52. Tomasi’s work, to me, was solid but never spectacular. I liked Patrick Gleason’s art well enough. But I especially didn’t care for how Tomasi wrote Damian early on. He just didn’t seem to grasp the nuances made so much clearer by Morrison. Perhaps I’m being unfair. Tomasi certainly wasn’t mailing it in. It just never stood out among the flashier Batwork out there. Yet slowly but surely, the winds shifted. Snyder’s muddled Death of the Family gave way to Zero Year, which began with tremendous promise but then overstayed its welcome. Morrison “killed” Damian in Batman Incorporated and moved on. Batman Eternal has been a fine book, and I’ve enjoyed the renewed vigor of Detective. But Batman and Robin (or, as it was known colloquially for awhile, Batman and … ) is now the one book that consistently gives the emotional payoff that the best Batman stories provide. After Damian died, Tomasi took Batman through the classic stages of grief by teaming him up with members of the Batfamily who best reflected those ideas. Then there was an unnecessary Two-Face arc that seemed designed to kill time until DC was ready to pick up Damian’s bo staff again. The Hunt For Robin, in which Batman began his quest for Damian’s corpse, was punctuated by a series of Brave and the Bold-ish appearances by other members of the DC Universe, like Aquaman, Wonder Woman and, perhaps best of all, Frankenstein. 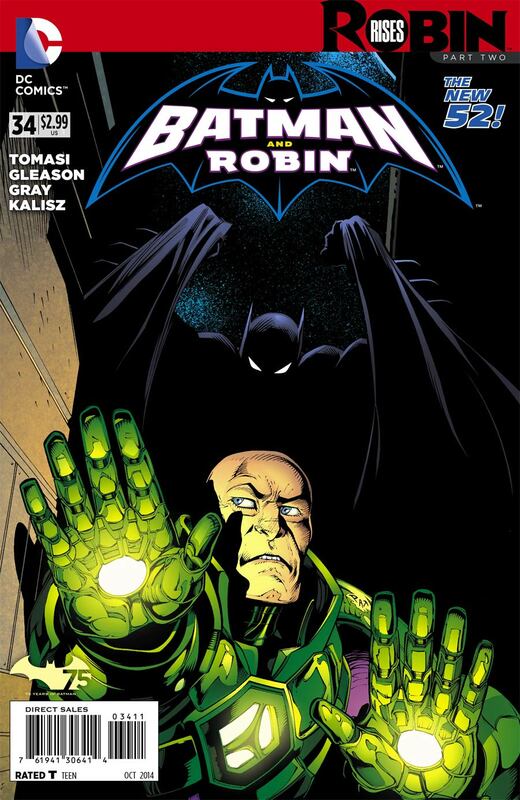 What we got was high adventure, high drama, classic Batman villainy with Ra’s al Ghul, and high emotional impact. Month in and month out. The selfie variant cover, which is all kinds of rad, even if I hate selfies. Finally, we’re at Robin Rises, which started last month in a special (Robin Rises: Omega) and B&R #33. We all know how this story is going to end. But Tomasi, Gleason and everyone else who’s been on the book has made this journey worth it. This about the telling and the telling has been outstanding. I cannot wait to read the next issue — which just happens to come out this week 8/20 — because this is the best Batman comic that DC is putting out right now. Also out this week: Batman Eternal #20; Batwoman #34; and, Teen Titans #2, to which I’m still giving a chance. 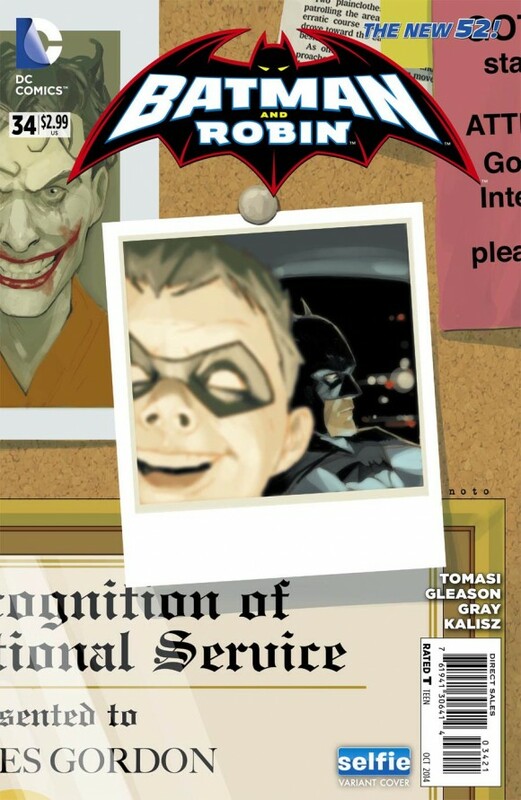 Oh, and speaking of Damian, the trade paperback Batman Incorporated Vol. 2: Gotham’s Most Wanted — featuring Robin’s “demise” — also comes out. Interesting… I think you’ve just convinced me to get back on board the “Batman And” book! It’s really very good, Patrick. Pick up the Requiem for Damian trade, skip the Two-Face story then pick up the Hunt For Robin/Robin Rises issues.